Before I decided to come out about my sexuality, I reached out for advice to someone who I knew was gay. I wanted to hear from another black man who I assumed to be out, comfortable and happily leading an open life. I was still very much petrified, but I mustered enough courage to ask him, "What's it like being openly gay?" The man looked at me as if I were the dumbest person alive before saying, "Why are you asking me? What makes you think I know?" Instead of bothering to note that anyone who had ever met him assumed that he was, I apologized for thinking that guy constantly leaving his dorm room in the wee hours of the night was anything less than a noisy study buddy. I hadn't been that embarrassed since my days of bed-wetting. Nor had I been that angry. I wondered, "Just who does he think he's fooling?" I suppose a couple of people were asking the same question of me. I didn't understand that at the time, and once I did come out, I started to get a little self-righteous. I felt that it was my responsibility not to be that kind of gay person. I wanted to speak out and help other gays — specifically gays in the black community — find themselves, the way I had hoped someone I thought was my friend was supposed to help me. I now realize that I was wrong for automatically believing that he or any other gay person has to be open about something so private. It's a lesson I'm reminded to share with others after reading Rachel Maddow's interview with the Guardian. The openly gay and brilliant MSNBC anchor was asked about her not-so-secretly gay peers who won't acknowledge their sexuality publicly. 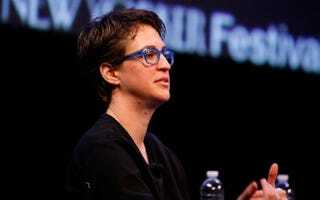 In response, Maddow quipped: "I'm sure other people in the business have considered reasons why they're doing what they're doing, but I do think that if you're gay, you have a responsibility to come out." It didn't take long for people to speculate on just whom she was referring to. Indeed, many thought that Maddow was singling out CNN's Anderson Cooper. Trying to calm the chatter before it got any louder, Maddow wrote on her blog, " … I wasn't asked about Anderson Cooper, I didn't say anything about him, he literally was never discussed during the interview at all — even implicitly." But when it came to her original stance on how her gay peers should be, Maddow held firm, writing: "Gay people — generally speaking — have a responsibility to our own community and to future generations of gay people to come out, if and when we feel that we can." To her credit, she does add that gay people should decide for themselves on the "if and when." I would be lying if I didn't say that there isn't a day that goes by that I don't find myself frustrated at all the men and women who I know are gay but choose to tiptoe around the truth for their own reasons. It's harder to counter the point that if more gay people continued to live openly, it would humanize being gay to the greater community, which would make it easier for all gays now and in the future. However, Maddow's words are easier in theory than they are in practice. Moreover, with respect to Ms. Maddow, it's much easier for a white lesbian to adhere to this virtue than her darker gay brethren. As a highly educated, successful white woman, she is afforded certain privileges that many gays of color still are not. Not to mention, being gay is often a bigger taboo within the black community than the white. And while she has certainly had to contend with her own battles with heteronormativity, it might not be to the same extent as, say, her black male counterparts have to deal with. To that end, her idea of "if and when" a gay person feels comfortable enough to come out requires more thought and explanation. As helpful as it would be, no one should be required to give any more of themselves than they are willing to give. I do agree with Maddow on one thing: If you're a closeted person vilifying gay people, you deserve to be outed and shamed for the hatred you project onto the world. But those who may accept their sexuality but don't want to lend their efforts to the greater cause are well within their rights, disappointing though they may be. Neither Rachel Maddow nor I should make you feel that you need to come out. The best we can do is hope our own efforts can make up the difference. Michael Arceneaux is a Houston-bred, Howard University-educated writer currently based in Los Angeles. You can read more of his work here. Follow him on Twitter.